WGU North Carolina surprised one of its new students by showing up at her workplace. WGU North Carolina Community Relations Manager Lynne Barbour didn’t come empty handed. She brought a bag full of university swag, cupcakes, and a big check to Wayne Community College, which she assembled on a table in a room full of the college’s employees. Then someone tricked Roma Lea Matthews, WCC’s associate director of admissions and records, into coming to the conference room. 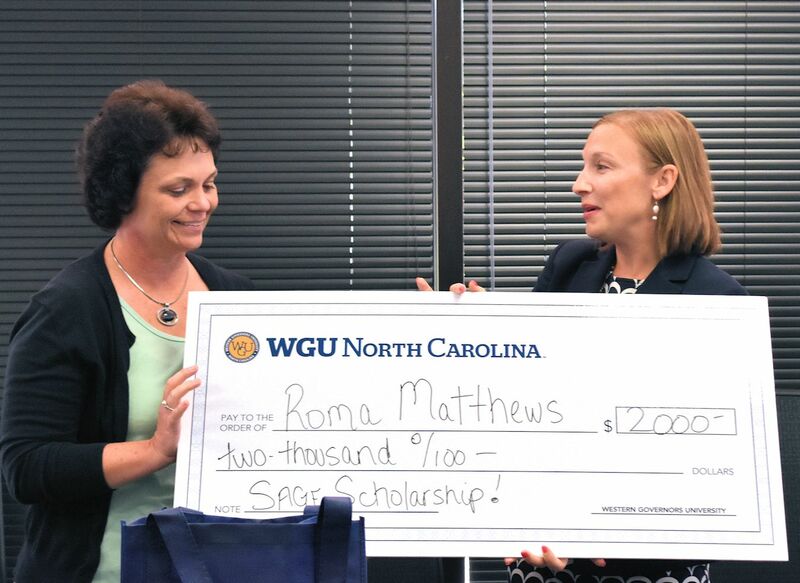 There, in front of her colleagues, she learned that she had won a $2000 “Sage Scholarship” from WGU North Carolina. WGU North Carolina Community Relations Manager Lynne Barbour (right) presents a $2000 scholarship to WCC Associate Director of Admissions and Records Director Lea Matthews who is a student in the university’s Master of Business Administration program. The scholarship, named for WGU mascot Sage the Night Owl, is a competitive national scholarship for new WGU students. Recipients are chosen based on their academic record, financial need, readiness for online study, current competency, and other considerations. Matthews has just started her studies in the university’s Master of Business Administration program. “I’ve really enjoyed it so far,” Matthews said. She has submitted her first papers and feels that she is on track to complete the degree in a year. Matthews who holds associate degrees in accounting and business management from James Sprunt Community College and two bachelor’s degrees in the same subjects from the University of Mount Olive. Wayne Community College and WGU North Carolina, an online, nonprofit university, agreed to a partnership this summer that provides discounts to WCC graduates and faculty, allows WCC transfer students to ensure their degree aligns with WGU’s baccalaureate programs, and established a scholarship program for WCC students who transfer to WGU. WGU North Carolina is an online, competency-based university established to expand access to higher education for North Carolina residents. The university offers more than 60 undergraduate and graduate degree programs in the fields of business, K-12 teacher education, information technology, and health professions, including nursing. Degrees are granted under the accreditation of WGU, which is accredited through the Northwest Commission on Colleges and Universities (NWCCU). Teachers College programs are accredited by the National Council for Accreditation of Teacher Education (NCATE), and nursing programs are accredited by the Commission on Collegiate Nursing Education. More information is available at nc.wgu.edu or by calling (866) 225-5948. Wayne Community College is a public, learning-centered institution with an open-door admission policy located in Goldsboro, N.C. As it works to develop a highly skilled and competitive workforce, the college serves around 12,000 individuals annually as well as businesses, industries, and community organizations with high quality, affordable, accessible learning opportunities, including more than 70 college credit programs. WCC’s mission is to meet the educational, training, and cultural needs of the communities it serves. Learn more about WCC at www.waynecc.edu.